How does one combine the works of Deepak Chopra and Tony Robbins with the teachings of Rav Hershel Schachter? How does Dr. Phil and Marianne Williamson become part of the right wing of Modern Orthodoxy? 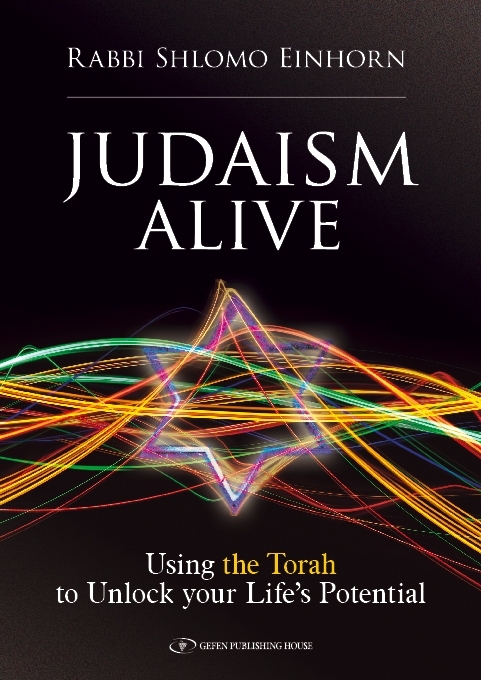 In his just published book, Judaism Alive: Using the Torah to Unlock Your Life’s Potential, Rabbi Shlomo Einhorn incorporates thoughts from popular culture by citing the likes of the rock group Queen, Muhammad Ali, and among countless others seeking to combine what he thinks is the best of modernity to guide readers to a better life. Einhorn finds himself right of center and considers Rav Hershel Schachter as his Rebbe and wears a black hat. Nevertheless, he states that “I do believe in learning from a wide array of teachers to the left and to the right.” Einhorn learned seven blatt every day, rather than the more Lithuanian Yeshiva approach of analytic study, thereby has completed learning the Talmud Bavli nine times. Einhorn also released a music album called Judaism Alive: A Musical Odyssey that went to #3 on the Itunes World Music Chart. This interview was so open and direct that I do not have to pull out his relationship to popular culture since he is direct in his use and acknowledgement of pop psych, new-age spirituality, Christian, Hindu and Buddhist teachers, rock stars, and talk show celebrities. They are all a form of Torah for Rabbi Einhorn. I had a long post on Rabbi Einhorn three years ago; it serves as a good compliment to this interview. He was also discussed in my Orthodox Forum article on Centrism and Popular Culture on the huge roll popular culture is playing in Centrist Orthodoxy. In that context I had discussed rabbis who are turning Orthodoxy into cruise ships of entertainment. If the left is turning toward social concerns, the right is turning to motivational speakers and a new form of Neo-Hasidism with their implicit social vision. This version is highly anthropocentric, neo-liberal in its concern for value, and peak this-worldly experiences. Early Hasidim used kabbalah from 200 years prior because it was the language and spiritual resource that they knew. Yet, they were using it to express new ideas and start a new vision. Spiritual positions such as Rabbi Einhorn’s Judaism Alive use Hasidism and Neo-Hassidism from two hundred and fifty, or even hundred years ago, but here too it seems that it is because it is the spiritual language and tool at hand in which to create new ideas way beyond the Hasidic sources. 1) What was the purpose in your book? I also wanted people to understand that the best of pop culture, great books, and a knowledge of human biology can all be used to invigorate are commitment to Torah. When you hear the deep traditions of our heritage echoed and or made clear in other areas of life it’s exciting. It’s more than validating. It’s about recognizing that the eternal truth of the Torah weaves its way through all of life’s vistas. 2) What does it mean to have Judaism Alive? Judaism Alive means a lot of things. In particular it means that our academic and at times very cerebral vocation is also exciting and passion inducing. It’s meant to be applied, lived, to serve as a guide for a happier and better life. Judaism Alive means that greater halakhic observance, if done correctly, can promote greater creativity, productivity, energy in our daily lives. I myself found that as I was writing I wanted to express the ideas in the book in some other creative format. I felt that the words of Torah were pushing to express inspiration in different ways. This got me to simultaneously write and compose my album “Judaism Alive: A Musical Odyssey”, that came out this summer. It was meant simply as a form of spiritual expression. We were all shocked and thrilled when it went to #3 on the ITUNES World Music chart. 3) How were you inspired by the book you cite Kim Dinan’s Life on Fire? Kim Dinan is an example of somebody who literally followed her dreams. We all give sermons about following dreams but not everybody does that. Her book resonated with me because I deeply feel that in my life as a Father, a husband, Pulpit Rabbi, Dean of a School – I feel like I am so blessed and living my dream. Yes it’s a little different than Kim’s. Thank G-d my dream isn’t to backpack down the Himalayas. It’s easier to backpack back down from Kiddush. Following your dream is part of the Judaism Alive message. An inspired Judaism will propel to search for your best life. However, it is Judaism’s spin on that concept and that means that we do not just throw it all away – leave our homes, families, community so that we can achieve serenity. Passion isn’t enough – I think Steve Jobs said that. 4) Why do you like Deepak Chopra and Tony Robbins. Please explain how they are Torah values? Deepak Chopra was my first entrance into the new age self-help world. I find with every single one of his books he has at least one distinction that is unique and potentially life changing. He writes that “in the midst of movement and chaos, keep stillness inside of you.” That is wonderful. Live is movement and chaos. There needs to be constant growth and give and take, or as the mystics call it ratzo v’shov back and forth. Without that we wouldn’t get anything done. The notion of stillness sounds like we’re being called upon to check out from accomplishing. No! Dr. Chopra argues that stillness is a way to achieve presence while we are running all over the place. There is so much Torah in that. Judaism vehemently believes in working hard, fast, and vigorously to accomplish. There is so much Torah to learn. There is so much kindness to be done. There is so much discord that needs our repair. The problem with that is we can break if we don’t stop and if we don’t realign our purpose and take care of our needs. So learning how find the stillness within While we move is the key to everything. Tony Robbins. I just love him. He is a guy who loves to find new methods and technologies to make life better. He lives to make people’s lives better. I have seen him give a seminar where he didn’t take a break for 10 hours. That was awesome. But he can do it because every hour is about making people’s lives better. And thinking like that give you the strength to accomplish so much. I think of the Lubavitchter Rebbe. He became Rebbe at 49. That’s unbelievable. We always think he must have become the Rebbe at 25 because he did so much. No! His work just began at 49. 5) What do you mean when you wrote “anything that teaches is Torah”? There is Torah in the literal sense. The books of Tanach, the Mishnah, the Talmud, Midrashim, Rishonim, Achronim and then there is Torah in the sense of things which we learn that comport with the values of the Torah. I think the Baal Shem Tov is saying that there is a Torah element to that as well. There is truth in it. Torah as truth. We need to be careful and not mix and match the two. I try my best to make that distinction. The Steipler is worlds removed from Deepak Chopra. Nevertheless, there is an idea in one of the Steipler’s letters that can change my life and there is an idea in one of Deepak’s books that can change my life. In that sense it is Torah – it instructs, it informs, it causes me to be better. 6) Therefore, are Dr. Phil and Marianne Williamson Torah? In the Baal Shem Tov’s definition as per instruction and inform – yes. In the sense of Torah literally, no. 7) What is the ZPD? Zone of Proximal Development is a concept developed by Soviet psychologist Lev Vygotsk. It asserts that there is a “sweet spot” by which students learn best. For example, material presented that is too easy (or below the zone) is already known and therefore doesn’t enhance our learning experience. Content that is too hard (or above the zone) is simply a waste of time because it is gibberish to the learner. Finding information that is slightly above what we’re used to maximizes the learning experience. To apply that personally, I found that when I forced myself to learn the sugyos (topics) of Kodshim(laws of Temple related sacrifices and vessels) I pushed myself into the ZPD. It was an amazingly rewarding experience. Let me add that “already known” material need not always be below the ZPD. When Ramchal writes that “I am not teaching you something you don’t already know”, he’s not suggesting that we spend the next 200 pages learning material below our ZPD. No. He means to say let us take what you already know and now develop it and root it so deeply in your experience. 8) You explicitly mention that Rav Nachman conveys the same message as Oprah on living mindfully. Isn’t it a new-age Buddhist concept? One of the great self-help thinkers of our time, somebody who just died this week – Dr. Wayne Dyer said Peace is the result of retraining your mind to process life as it is, rather than as you think it should be.” That line reflects the need for us to be present. Stop using our conception of what should be to force realities that aren’t. Oprah obviously embraced this movement to accept the Now as it is. Eckhart Tolle brought the power of now to the mainstream. Where Rebbe Nachman fits into this schema is that he constantly drives home the idea (see opening piece in Likutei Maharan) about us appreciating the world and items therein as they are. There is a Divine chochmah that animates everything, without which it couldn’t exist. Mindfulness is about pausing to appreciate that. Stopping to make a brachah, applying “one is obligated to see themselves as though they are presently leaving Egypt” at the Passover Seder, etc are all expressions of that mindful energy. Judaism is not about commemoration. It is living a particular experience in the present moment. 9) You mention at several places in your book on the need to learn from Rav Nachman of Breslovs teaching about creation leaving an empty void, devoid of divinity.’. How do we accept this empty void in our lives? Parker Palmer calls this “hidden wholeness”. There is a part of our lives that appears untamed, more challenging and outside the realm of a simple self-help quote. And guess what, that’s okay. It’s all part of how G-d designed us. When I can recognize who am I and what my flaws are I am able to deal with myself as a religious persona. I can’t begin to understand why I may hurt those I love if I don’t understand that in me is an empty void that seeks significance. If I know that then I can find a more positive and empowering way to meet this “shadow side”. 10) You quote a Hindu guru that meditation gets us in shape for the day and then you don’t give any meditation instructions. What am I to do with that quote? I left it open ended because there are so many meditation possibilities. It’s not for one to select one that is most effective. Rav Aryeh Kaplan argued that Shemonah Esrei is the greatest meditation. Rebbe Nachman argued that talking straight with G-d is the greatest meditation. On your blog, you once spoke a bit about the mediation practices of Divine names from Abulafia and Rav Itcha Meir Morgenstern. Eastern mediation, Western Meditation, Hypnotherapy. Endless. They all contain a powerful mechanism by which to engage transcendence and periodically presence. 11) How do we have to learn to find answers within ourselves ? G-d discerns the heart and investigates the innards (Hashem bocher lev u’bochen Kelayos). There is a teaching in Judaism that our kishkes have answers. Our inner knowledge may not be exceptionally nuanced. Or, I should say, our perception of what our inner world already knows isn’t so nuanced but it is strong. On the other hand, Judaism does not assert “Let your heart rule your head”. No. We, as a people, stand for – “a nation wise and understanding”. Utilize wisdom to make sense of what we are feeling. By feeling I mean what we may sense in our gut to be correct. 12) How do we stop and observe without judging? There are the times to just stop judging what we do. The Buddhist thinker Thich Nhat Hahn speaks a lot about observing our anger instead of judging it. That is huge. A lot of therapeutic approaches suggest beating your anger, like hitting a pillow. Hahn notes that this only breeds more anger. Instead, stop judging your anger. Note it and care for it. 13) What was the general reaction to these sermons? They literally all have gone over well, Baruch Hashem. My best sermons are always delivered after I have already built a rapport with my community and congregants. They understand me and get me. They know what my hashkafa, my worldview, is really about and therefore the quoting of those “outside the pale” doesn’t alarm them. On the flipside they also understand my reverence for those who lead a lifestyle way too rigid for any of us. I imagine though, as this book is read without the possibility of a prior rapport – there will be some push back. 14) Your book lacks any reference to Torah or to mitzvot except as a backdrop, do you think Orthodox Jews are now focusing on their challenges of their lives with the mizvot as a backdrop? Oh, everything here is about the service of G-d (avodas Hashem). No exception. Only a life lived with G-d in mind is one that is optimally fruitful. The mitzvah is the main mode by which we serve our Maker. The Socotchover (in his remarks on the 7th Day of Pesach) and also the late Tosher Rebbe (also in his remarks on the 7th Day of Pesach) both note that the endpoint is not the mitzvah, though, it is the relationship with Hashem. My book starts with the end in mind and therefore there is less emphasis on mitzvah. G-d forbid I am attempting to bypass observance. On the contrary I am attempting to provide a meaningful framework for the observance. Let us not forget the Why. This book speaks to “why” we ought to connect, “why” we ought to locate G-d in our lives. The mitzvos are a way to achieve that level. This book starts on a concurrent track teaching us that a life lived with these values takes you there. I do agree that Orthodox Jews do focus more on the challenges in their lives rather than the mitzvos. However, it is my hope that if this book is taken to heart we can all come to realize that many of life’s challenges can be made more noble and more manageable through proper mitzvah observance. 16] Why use entertainment and popular culture in education? Why use glitz? If I have a secret to survival and I want to share it with you but I know that you are distracted by the TV blaring, the Snapchat message coming in, the Amazon Alexa device sounding off, on an on – how do I get your attention? That’s how entertainment and glitz is used in education. It’s a call to attention. There’s also a assimilation advantage to using entertainment. If I present a dry class on blessings there’s a chance the listener may observe a bit more than before. But I present a class on blessings via an entertaining evening with Sushi in front of you – it becomes memorable and palpable and therefore you will be more likely to assimilate the values. 17] Do the ideas in the book show up in the Yavneh curriculum? The ideas in Judaism Alive show up in Yavneh. Every teacher is asked to self-audit their classes and notice whether they are big or small. By big I mean feel as if they are larger than life. Don’t just teach Lashon Harah (speaking slander about another), give Lashon Harah full color by giving a class on posting reviews on YELP. That’s Judaism Alive. 18] Many Rabbis do not teach your path of living fully? Do you feel isolated? Are you the way of the future? I don’t feel like I’m a lone ranger. When Rav Hershel Schachter gives a class for two hours that twists and turns in all different directions and ends by answering the challenging question on the role of documents in Jewish Law (Shtar Raya vs. Shtar Kinyan), oh wow is Judaism Alive. When Rav Elazar Shach pens a letter to a struggling with his studies – his emotions come bursting through – and that is Judaism Alive. The pages of Rav Eliyahu Dessler’s Michtav M’Eliyahu are filled with psychological insights that glean from so many different sources. Every Jewish book on my shelf is so different and yet each idea leads to the same place: avodas Hashem – the service of the King – that is Judaism Alive. 19] You learn all of shas (the entire Talmud) every year, does that mean seven blatt a day? That seems very non-yeshivish that usually emphasizes learning, slowly with commentaries. I learn shas (the entire Talmud) every year. Yes that’s 7 blatt a day. I do it in a yeshivish way. My in depth learning was limited because I was missing mastery in scope. My in depth learning was an exercise in futility because I didn’t have enough range to fully develop answers. I feel like since I started this my critically thinking skills when studying Talmud have improved exponentially. Look, what motivates me is ultimately the style of Judaism Alive. I love being in a different world each day. To start the morning in tractate Gitin and then later that night to be lost somewhere in Bechoros is magical. I like being all over the place. Sometimes that gets in the way of focus but it makes the journey fun. 20] What are the differences between the Orthodoxy of Los Angeles and New York? New York Orthodoxy places a premium on intellectual and cultural sophistication. That, on one hand, is really exciting for a teacher. On the other hand I think a lot of good content and exciting ideas gets dismissed simply because it doesn’t appear high-brow enough. Charisma is sometimes mistaken for compensation. Los Angeles Orthodoxy places its emphasis on tradition and the way that things have been done. That of course is also a double edged sword. On one hand, it keeps the Jewish community at a fairly high level of observance and Torah knowledge. On the other hand, it tends to reject innovations that could be used to enhance the overall Jewish experience.